Stuffed mushrooms make a delicious, bite-sized appetizer that’s low-calorie and low-fat. Eating a healthful appetizer before your meal helps fill you up so you eat less of the main course and — hopefully — fewer calories and fat. With most diets, you can eat as many as five stuffed mushrooms as an appetizer without going over your nutritional goals. Clean the mushrooms, discard the stems, scoop the centre to make room for the stuffing. Carefully immerse the mushroom caps into the marinade and let it rest on the counter for 30-40 minutes. Combine mashed potoatoes, chilli powder, ginger-garlic paste, roasted peanuts, salt, chopped coriander in bowl. After resting time-fill a little stuffing into 6mushroom cap skewer the mushroom carefully to the tooth pick and cover with other mushroom cap. Repeat the same with all the mushrooms. Heat the skillet, brush some oil and arrange the stuffed skewer mushrooms on the heated skillet and toast for 4-5minutes on a low flame. Flip and toast other side for another 4-5minutes. 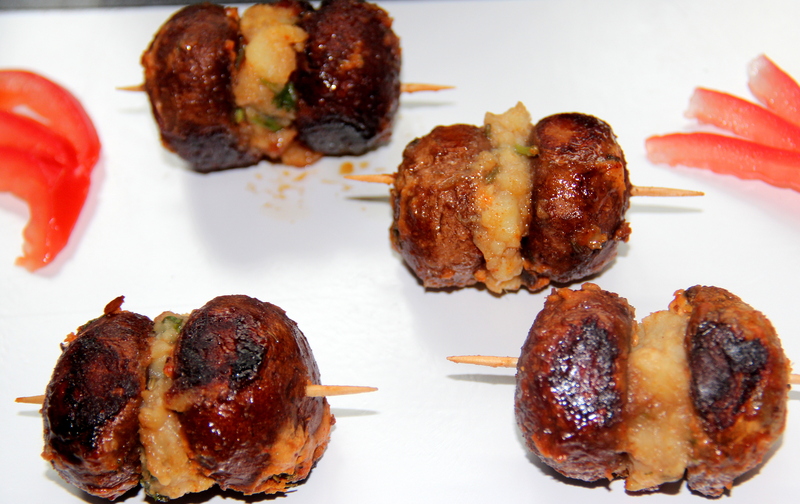 The stuffed mushroom skewers can also be toasted in oven for 8-10minutes at 180deg until tender. Posted on September 11, 2014, in Appetizers, Indian, International, Starters. Bookmark the permalink. 51 Comments. This sounds yummy! I love mushrooms and this stuffing sounds like a great recipe! Wow! I love your recipe! Looks delicious! Thanx Rani for your visit and lovely feedback. .. Lately, I’m really into mushrooms…thanks for this recipe, will give it a try soon! beautiful recipe.. Love mushrooms this way!! Thanx for your kind words Noodles. … have a fab weekend…. This was quite an original one, never in my life thought about it. And not hard to do. 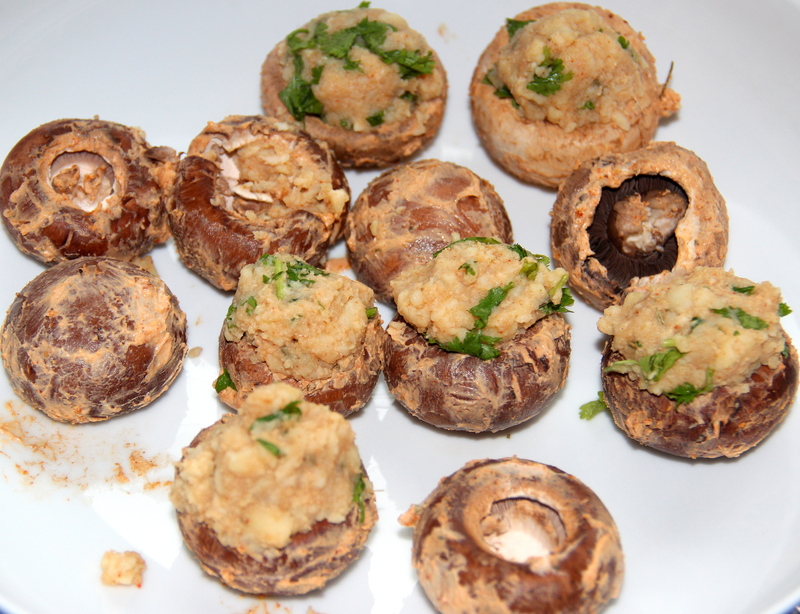 Stuffed mushrooms are one of my all-time favorite appetizers. These look delicious! Oh yum, these look so scrumptuous! These look delicious. I love stuffed mushrooms! Thanx Linda for your lovely words. .. feels good. .. have a fab weekend dear..